When it comes to creating a lean, strong midsection, you cannot neglect training your obliques. Aside from giving you a toned-looking mid-section, your oblique muscles help you bend your torso from side to side and stabilize the core during any movements. Strong obliques are therefore essential in protecting your spine longterm, and in aiding you perform daily activities. To train your obliques you need to work them in the way they naturally function, which is isolation (holding steady), flexion (bending) and rotation (twisting), challenging them from all angles. Because the core’s function is to protect your back, we recommend you skip the weighted exercises and use your own bodyweight to strengthen your obliques, while lowering your risk of injury. However, don’t be mistaken in thinking that training your obliques and the rest of your ab muscles will get rid of a muffin top or love handles. To flatten your belly and really let your abs shine through, you need to put in just as much, if not more, work in the kitchen. That doesn’t mean you should skip working your core, though, as those muscles serve very important every day functions (and give you awesome cuts when you do melt that fat off through proper nutrition). Work the following bodyweight oblique exercises into your regular ab workout and watch your middle whittle. You can do side planks on your forearm, or you can prop yourself up on your hand, which is more difficult. Lie on one side with your hips and feet stacked. Place your elbow or your hand, depending on what modification you are doing, directly underneath your shoulder and place the other hand on your hips, out of the way. To begin, use your core muscles to lift your hips off the ground and hold. Your body should form a straight line from your head to your heels. Hold for 30 seconds to a minute then repeat on your other side. 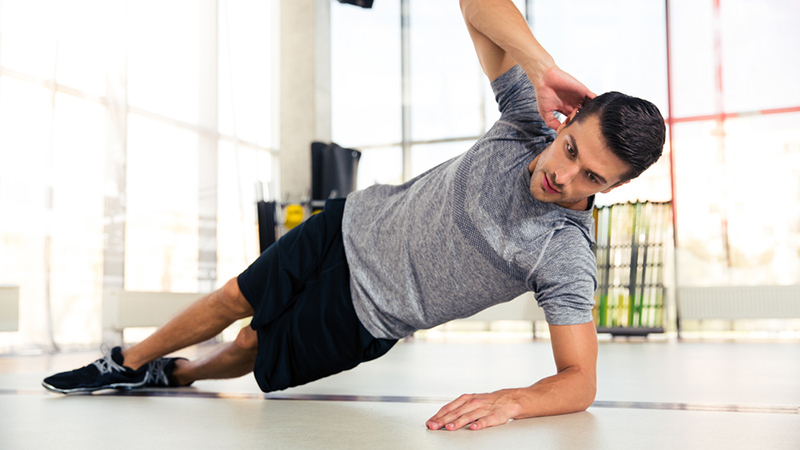 When movement is added, always start by doing your planks on your forearms to make sure you can keep proper plank form throughout the set before trying these on your hand. keeping your plank is always first priority. Get into side plank position. To begin, drop your hips below horizontal, but do not let your hips rest on the ground. Then squeeze, pulsing your hips up above horizontal. repeat dropping your hips below and then lifting your hips above horizontal and squeezing your obliques with each rep.
Do 15 reps and then repeat on the other side. Do these planks on your forearms so your hips can reach the ground, but don’t “pray”: your forearms should stay parallel to each other instead of turning inward. Bringing your hands in to form a tripod will round your shoulders and throw off your form. Get into plank position on your forearms. To begin, keeping your belly button pulled in and your core tight, lower your right hip to your right side, tapping it on the ground. Bring it back up to center plank and then drop your hips to the left side, tapping your left hip on the ground. Repeat, alternating tapping your hips left and right, pausing briefly in the center each time. This one really challenges your balance, working your entire core, but really calling on the obliques to stabilize you through the entire movement. Get in to side plank position. To begin, keeping your top leg straight, lift it as high into the air as you can. Be sure to keep your hips high, as they will want to drop when you raise your leg. Hold for a beat, then lower. Repeat for 15 reps than switch sides.